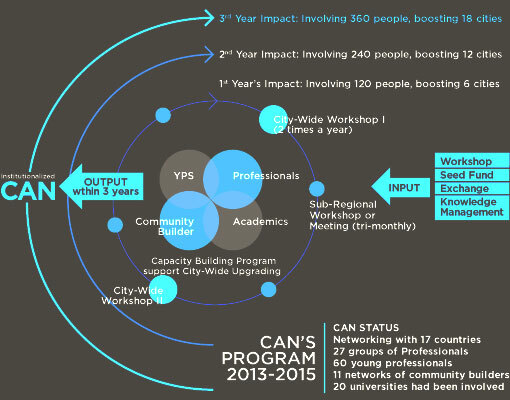 Community Architects Network (CAN) is a regional network of community architects and planners, engineers, young professionals, lecturers and academic institutes in Asian countries. Established in 2010, the network has been supporting community-driven projects under the Asian Coalition for Community Action programme (ACCA) regarding people housing, city-wide upgrading, and recovery from disasters. We believe the role of community architects is to build the capacity of people, by participatory design and planning process to make people be their own solution. Since 2010 as the network and networking started, there are 27 groups of young professionalin 17 Asian countries involving by working on participatory design and planning, city-wide mapping and surveys, seeking design solution to improve quality of life and health of community, as well as training community builders. When we talk about doing city-wide slum upgrading in the whole Asia region, we need lots of architects, para-architects and experienced community-based builders to work with people in hundreds of communities and to help them develop and implement their upgrading plans, in a big way. We have been trying in different ways to link with groups of young architects and professionals in various countries and to help them work with communities - on both the ACCA-supported upgrading and housing projects and on other community initiatives. The movement is becoming quite active now, and a lot of things have been happening over the past few years, as more and more countries open up this process. In the first 2 -3 years we have focused our work on four activities to support, strengthen and expand this community architecture movement in Asia. 1. Building groups of local architects to work with people, in each country. Many countries don’t have groups of local community architects to work with the communities yet. So in some countries, we have assisted by organising pilot community-upgrading and housing design workshops that are tied to actual projects, with support from the local NGOs (in Nepal, Lao PDR, Myanmar, Fiji and Penang). An important part of these projects is linking with faculties of architecture and young professional people in that place, and inviting them to participate in these projects and to learn how to work with communities. After that, we try to support the young people to keep working with the communities. and technicians of a design process which belongs to people (community design workshops in Vientiane, Phnom Penh and Yangon; earth-block making workshops in Vinh, Phnom Penh and Ulaanbaatar; a community mapping workshop in Fiji, a bamboo construction workshop in Davao and a slum-upgrading architectural competition in Surabaya. We’re now planning a big regional mapping workshop in Karachi.). to share their experiences, share their knowledge and assist each other in different ways. In June 2010, we organized a 5-day regional gathering of 100 community architects and community builders in Chiang Mai, which gave a chance for all these groups to meet, present their work, compare notes and begin to set joint plans as a regional network of community architects. (Full transcripts of the interesting presentations at this meeting can be downloaded from the ACHR website.) Many of these groups also travel to join in the design workshops and training seminars in other countries. One of the first activities of this new regional network (which was officially inaugurated in Chiang Mai) has been to support fledgling community architect groups in each country with small seed funds of $5,000 per country. So far, community architecture groups in nine countries have received this support and are using it in a variety or ways to initiate pilot projects with communities or to build their own national community architects networks. In some countries, these groups already existed (as in the Philippines, Cambodia, Pakistan, Indonesia and Vietnam) and in some countries they are just getting started (as in Lao PDR, Myanmar, Fiji and Mongolia). These groups can include young architects, architecture students and professors, engineers, planners and community builders. We are also working to document the work of community architects around Asia and to help disseminate their stories, experiences and ideas through various media, including publications (a book on community architecture work by key groups around the region and a series of handbooks on mapping and community planning have already been published, and another handbook on the poor in heritage cities is now in process), documentary films about the work of community architects, and the setting up of a regional community architects blog / website. Support for community architect workshops, and national workshops (6 per year x 5,000 x 2 years) 60,000 Year one: Malaysia, Bangladesh, Korea, Lao PDR, Pakistan, Nepal, Philippines, Indonesia, Vietnam, Sri Lanka , and others to be determined according to need and demand from grassroots groups. Support activities with universities, students, change of curriculum, or other activities to link professionals and communities (15,000 per year x 2 years) 30,000 A variety of activities with academic institutions, including summerschools, internship programs, workshops on curriculum reform, bringing in community persons to give inputs to planning/architecture departments, and so on. Support, building capacity, training, organizing, building network of community builders, community surveyors,community technical experts and networking (25,000 per year x 2 years) 5-10 activities in at least 5 countries, per year, depending on need and demand.